Members of this neotropical genus perch on tree trunks with their wings pressed flat against the bark. The males of some species make an audible clicking sound in flight, which is the source of their colloquial name "crackers." This feature is lost in some of the derived members of the genus (Garzón-Orduña, 2012). The phylogenetic hypothesis is based on a cladistic analysis of 93 morphological characters using implied weights (Garzón, 2012). Garzón-Orduña, I.J. 2012. Phylogenetic evidence for loss of sound production and a shift in sexual recognition signals in Hamadryas butterflies (Nymphalidae: Biblidinae). Systematic Entomology 37, 84-101. Jenkins, D.W. 1983. 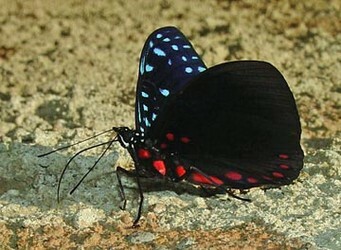 Neotropical Nymphalidae I. 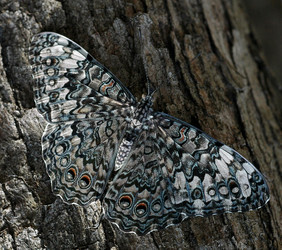 Revision of Hamadryas. Bull. Allyn Mus. 81, 1-146. Page: Tree of Life Hamadryas Hübner 1806. Authored by Andrew V. Z. Brower. The TEXT of this page is licensed under the Creative Commons Attribution License - Version 3.0. Note that images and other media featured on this page are each governed by their own license, and they may or may not be available for reuse. Click on an image or a media link to access the media data window, which provides the relevant licensing information. For the general terms and conditions of ToL material reuse and redistribution, please see the Tree of Life Copyright Policies.